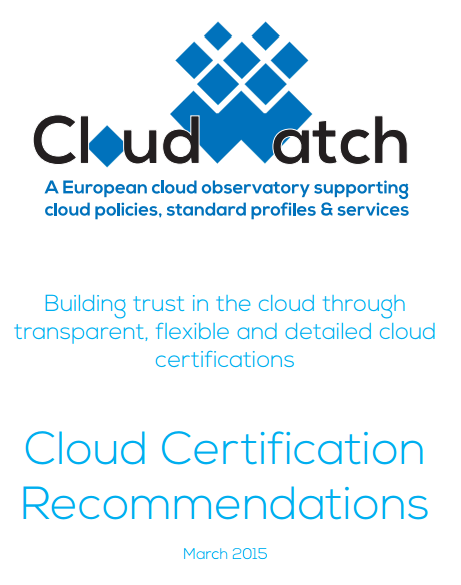 CloudWATCH: While cloud technologies and services have evolved fast are are increasingly benefitting businesses, governments and consumers, contracts regulating cloud services have not. Cloud service providers typically offer contracts in a standard and non-negotiable form. Cloud service customers are typically data controllers under European Union law, but may find it difficult to discharge services towards data subjects and Data Protection Authorities. This document gives an overview of the results emerging from the first Concertation meeting for the unit Software Services and Cloud computing. The document highlights the main outcomes of the event including an initial analysis of potential clustering themes and future collaborations. The document also examines the use of standards by Call 8 and Call 10 projects. The objective of this document is to provide some basic guidelines to cloud clients when entering a cloud computing contract. A series of recurrent contractual issues has been identified and addressed in a short and comprehensive way from the data protection law standpoint. References to other checklists and standards tackling issues critical for cloud services are also provided when relevant. This report provides a framework for the presentation of use cases for the purpose of the derivation of standardization requirements and the development of standard profiles for various areas from the cloud computing domain. It is intended to be of value for researchers and standardization experts that employ a use case driven approach. The 2nd Concertation Meeting explored themes for LEIT 2016-2017 Programme through keynotes and break-out sessions dedicated to cloud computing research, software engineering and open source research. This report provides an overview of the event proceedings.